Mediation is a procedure in which two or more persons with the help of a neutral mediator are able to find a mutual acceptable solution of their conflict. Contemporary mediation procedures were first developed in the U.S.A. in the sixties and seventies. Mediation enables parties in conflict to discuss their underlying needs and interests instead of just fight over legal rights and entitlements. 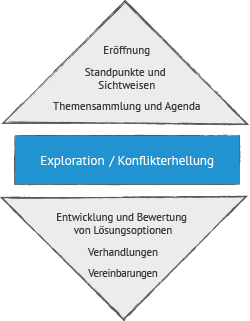 The mediator facilitates the process of conflict resolution, however, the decisions are only be made by the affected parties. Mediation is confidential. No details about what occurred during the mediation, or about the settlement that was reached, can be discussed outside the mediation room without the consent of both parties. Mediation is basically a so called alternative dispute resolution method, usually outside the court before a legal action is taken. Mediation involves negotiation to reach consensus in contrast to litigation, where the parties may not be interested in reaching any agreement whatsoever. Mediation involves a neutral third party which has no authority to settle the dispute. The mediator is not a judge or arbitrator but a facilitator. A mediator simply encourages the parties to reach agreement. Mediation does not focus (backwards) on rights but is rather future oriented on needs and interests. community and neighborhood disputes, even in criminal conflicts. Mediation is an ideal form of conflict resolution where both parties want to continue a personal and/or working relationship. If the parties have had a working relationship, which has operated successfully over several years, formal grievance procedures could cause irreversible damage because of their adversarial nature. Mediation encourages dialogue between the parties, and encourages them to find a situation where both are winners. Mediation is particularly useful where there are several issues in conflict. In this situation, it is often productive to trade interests in an attempt to reach a solution. Further, mediation is suitable where there is uncertainty in the rules or standards relevant to a dispute. Mediation is useful where the parties consider privacy and confidentiality to be important. Where the parties have ulterior motives such as wishing to use mediation to gather more information. Where one party is suffering from an emotional or psychological disorder. Family mediation refers to separation and divorce matters, parenting and custody arrangements, property settlements and family disputes about wills and inheritances. Construction mediation refers to conflicts regarding building contractors, architects and engineers, property companies and clients. Environmental mediation refers to disputes in the public sphere involving planning, building and environmental issues. Environmental mediation differs from most other forms of mediation in the following ways: first, there are multiple parties involved such as governmental, institutional, interest groups and individuals; secondly the mediations are typically a series of public and private meetings with the various stakeholder groups; and thirdly, the issues at stake have a direct impact on the community. 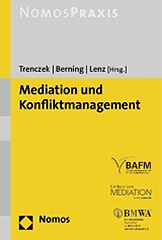 Victim-offender mediation (VOM; in German Täter-Opfer Ausgleich TOA) was the first form of mediation to develop and find recognition in both theory and practice in Germany. The centers offer a mediation to both, victims and offender, to deal with the conflicts that led to or arise from an offense, and to settle the desipite with a mutal agreement of regarding restitution and redress. sustainability of agreements and client satisfaction with the agreed solutions.